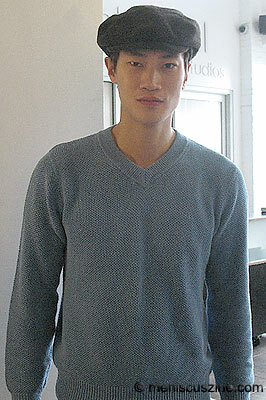 Asian male models are few and far between, which is a reality that Philip Huang hopes to change. 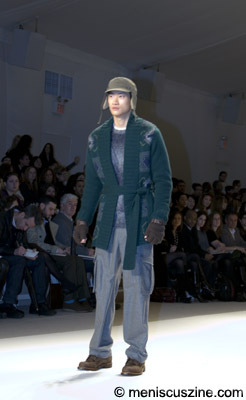 Huang, a top Asian model from the Public Image modeling agency, was a major presence during New York Fashion Week, walking a number of shows including Nautica and Lacoste. Meniscus spoke with this rising star during a male supermodel photo shoot for GQ Taiwan under the direction of photographer and creative director Chiun-Kai Shih. Meniscus: Could you tell us briefly about your background? Huang: I am 27, and I was born in Manhattan and grew up in Cleveland, Ohio. I moved to Philadelphia to go to school at Drexel University, and that’s when I first got started. I was commuting to New York, doing my castings. It was just a part-time thing, just for some extra money, because college kids are broke, you know. I was trying to find an innovative way to not be a waiter or a busboy, or one of those tedious jobs. Modeling was a good income for something on the side, and it was just some extra cash. It’s weird how it started because I really wasn’t expecting anything. I graduated from college, and I gave this a year because I had my resume built up already. I gave myself a year, and it just happened. What made you choose modeling as a profession? I started in Philly and, I don’t know, I just kind of figured that there weren’t really any Asian models [out there], and I went to an open casting at a hotel for Model Search. The event was held in D.C. I was more curious than anything else. Five years ago. I’ve been modeling for five years, full-time almost four years. I did about nine or 10 shows. I did Lacoste, I just did Philip Lim last night, also Rock and Republic and others. Have you done Fashion Week in other cities? Yes, I usually travel to Milan and Paris. How do Milan and Paris compare to New York? First of all, in Milan and Paris, it’s just men’s [fashion], so you have all that testosterone [laughs], just getting into trouble. Chicks keep you away from trouble sometimes [laughs]. So it’s different in that sense, that it’s just men. And it’s just a different culture, you pretty much have to deal with people differently. [In Milan] you’re dealing with mainly Italians, and then you go over to France, and you’re dealing with the French. So basically, it’s the difference between American and European culture? Yeah, and I think they work a little differently. For example, castings in New York, they’re so much quicker. Sometimes out in Milan you have to wait two hours, just the process of everything and how they work. You’ve said you got into modeling because you didn’t see a lot of Asian models in the business. So besides making money, was this a big factor in your choice of profession? Yeah, that was also a challenge for me, and something that I saw that was missing in the advertising industry, and something that I felt I could fulfill from day one. I wasn’t sure if it was going to work, but I just went with it. I never doubted myself, just kept plugging away. And do you see this changing? Do you find that there are more Asian models working now than when you started? Oh yeah, I definitely do, there’s a drastic change. For example, there’s a lot of female Asian models now, they’re more common now, they’re making their presence in big campaigns, big advertisements, shows. Men, I feel like they’re still a couple of steps behind. There’s not many advertisements featuring male models. The females have a stronger presence right now. But times are changing, things are changing. From when I started to now, it’s drastically different. The world is changing, there’s much more diversity now. And I think businesses and fashion have to evolve as the world is changing. How long do you see yourself modeling? Are you planning to branch out into other areas, such as acting? Definitely, there’s a couple of things I’ve been working on in the past year. I’ve been doing real estate on the side, and I just got a building about 17 months ago. Also, I’m getting back into acting. I really feel inspired now, and we’re working on a couple of scripts. There’s one that just came on the table about four days ago. Do you have advice for other Asian men, or anyone else who wants to get into modeling? Mainly, you just have to believe. You just have to believe in yourself and convince yourself that you can do anything, and anything is possible. I’ve seen my life change, and I’ve never stopped believing in myself, and I had good people around me that made me believe, made me see, to just really believe in yourself. If I didn’t have that mentality, I would have given this up a long time ago, and I wouldn’t be in the position that I am today because it was really tough getting started, and I did go for a year without booking any jobs. My first year, I probably saw a hundred clients and I didn’t book one thing. After that, it was a real struggle, you know, getting rejection after rejection. But you’ve got to believe in yourself, and pull yourself through that. Philip’s shoot for GQ Taiwan will appear in the April 2008 issue.